THE CRF250 RALLY, the newest member of Honda’s adventure family, is finally here after being introduced at Eicma. If it feels like you’ve been waiting a long time for this, it’s because Honda first teased it as a concept in March 2015, before showing us a prototype, then announcing that it’s heading for production around this time last year. The recipe for the CRF250 Rally is essentially: take a CRF250L, clothe in bodywork inspired by Honda’s CRF450 Rally, and introduce a few changes to make it adept at covering distance over tricky terrain. 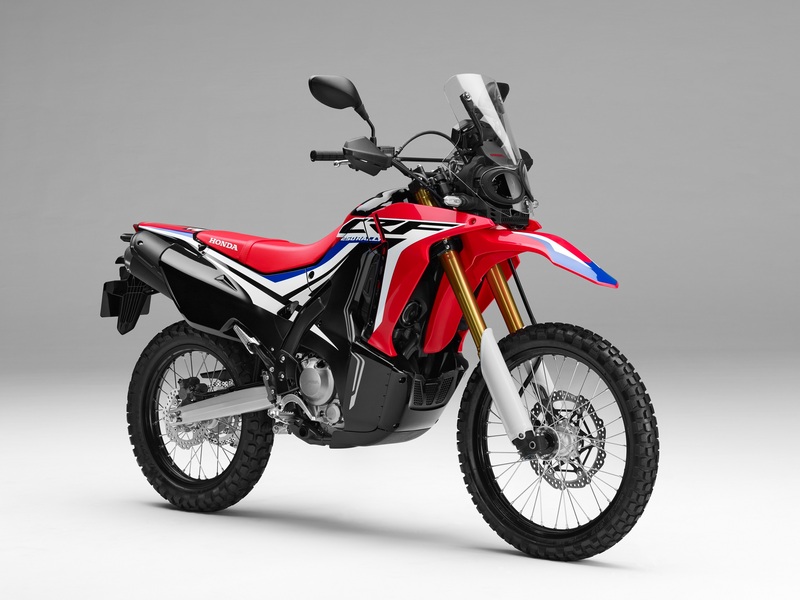 The fuel tank is larger – 10.1 litres instead of the CRF250L’s 7.8. The CRF250 Rally also gets a substantial looking skid plate and a gear lever with folding tip, for when the front folds, or you tip… over. Power comes from the CRF250L’s revised 250cc liquid-cooled single-cylinder four-valve DOHC engine, which makes 24.4hp at 8,500rpm and 16.66lb/ft torque 6,750rpm thanks to a revised airbox, throttle body and new, lighter exhaust system. The bike’s wet weight is 157kg. Chassis changes include a new 43mm Showa USD fork. It still gives the same 250mm travel as the CRF250L’s but is 50mm longer and has altered spring and damping rates to suit the Rally’s off-road mile munching ambition. The front wheel spindle is also 2mm wider in diameter. At the rear of the bike, there’s 25mm additional travel. To provide a more comfortable riding position with a better view of the land, the CRF250 Rally 895mm seat height is 20mm higher than the CRF250L’s. The all-round, adventure loving CRF250L also gets updated for 2017 with a restyle and revised Euro 4 compliant engine with more bottom end power – the same as the Rally. Other changes include a new digital dash that includes a fuel gauge. It’s also got a 2mm larger diameter front wheel spindle, ABS as standard and reworked rear lights which are tucked out of harm’s way.